Located on the south-eastern coast of the Persian Gulf, Dubai is the most populated and largest city in the UAE (United Arab Emirates). It is one of the seven emirates of the country and is also the capital of the Emirate of Dubai. The UAE has a very diverse culture and society which saw a change in its population of tribal community with invasion various other nationals. One of the primary comers was the Iranians followed by Indians and Pakistanis. The architecture, music, cuisine, attire and the lifestyle of the Emiratis have the prominent influence of Arabian, Persian and Islamic culture on it. The city has ample amount mosques scattered all around the city that calls on the residents for daily prayers. Friday is observed as the holiest day of the week, so the city observes weekends on either on Friday-Saturday or Thursday-Friday. The Emiratis are popular for living a very leisurely life, enjoying good food, sports, Dubai Dance, and music etc. The Emirati culture is primarily based on Arabian culture and has a heavy influence of Persian lifestyle too. The Arabian and Persian influence on the architecture of Dubai and the rest of the UAE is a part of their local culture, giving it a life and identity. One may find Persian influence on the culture more evidently in the arts, architecture, and folk Dubai Dance. Belly dance is one of the dance forms popular among the UAE masses. It is an expressive form of dance that involves complex movements in the torso. It has seen an evolution with a change in its form depending on the country and region, in style and costume too. 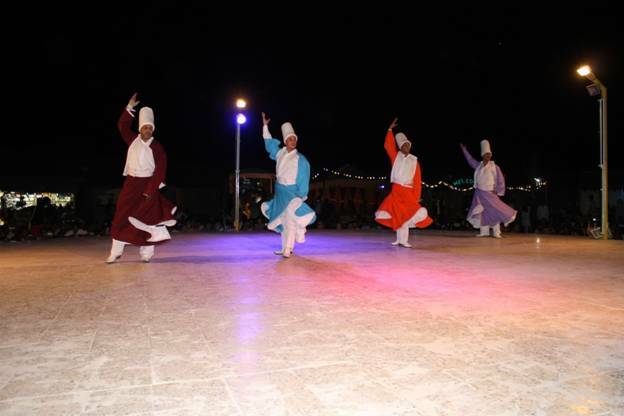 Folk dances like ‘al-habban’ are also popular in Dubai and its neighboring cities which are originally Persian dance forms. The local Emirati culture also has an influence on India and East Africa. These dance forms and music has been a part of Emirati culture for a long time, and had passed down generation to generation, and has seen a rise in the culture. The UAE is a part of the Khaleeji tradition of Arab. Yowla is also a type of music and dance that are performed in communities. The costumes worn by the dancers for such dance performances are usually very bright and colorful, the clothes the belly dancers wear are called the ‘bedlah’ that consist of skirt or harem pants, jeweled blouse that resemble a bra and a studded belt. Belly dance usually focuses on the belly and its intricate movement, so the belly area remains naked for the audience to the movements evidently. The belly dance suits are designed with sequins, coins, rich embroideries, and crystals etc. The music to which the dancers dance is either very cheerful or very serious depending on the demands of the audience, the movements of the dancers are fluid like and vibrant. There are many dance schools that teaches one not only the traditional Emirati dance forms but also internationally acclaimed dance forms like Tango, Salsa, Samba, Jive, and Jazz. Western dance forms are fairly popular among the young masses of Dubai.